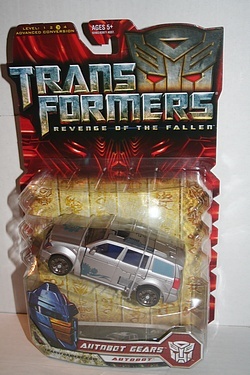 I'm starting to see a number of markdowns on the Revenge of the Fallen products in stores, though that is making it even more noticeable that so many deluxe figures hit the shelves wave after wave, but now are piled up with no new product. Well, there are still some great later-wave figures, and Gears is one of them! A classic character name, though not really his classic look, I'm glad to see that Gears is still guilty of complaining about everything! Click the image for his stats and his full, crotchety bio!